Sometimes I think we convince ourselves that God isn’t aware of what is going on. This verse says otherwise. In fact it takes it to a whole new level. Not only does he hear and see, but this text reminds us that he is the Creator of our very ears and eyes so of course he knows. Not only that but he also rules over the world, all the nations. All knowledge we have us taught by him. 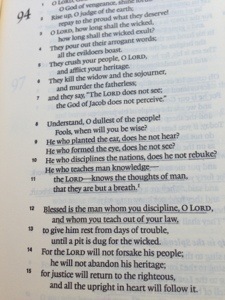 When we rebel against him we actually are using the mind that God gave us to decide to not obey. God knows even our deepest thoughts. That’s scary, as for me I have some pretty sinful thoughts. How does he still then love me? What does he think of me? If we are his adopted sons and daughters by faith in Jesus, he sees Jesus in us and by faith alone we stand justifies before him. Each day then is lived in grace as we grow, fail, grow some more, fail some more…yet always under the all knowing all powerful and all loving, eyes and ears of our Heavenly Father.